today, the shortest day of the year, and William has been reminding us constantly! I have sold another two corsages on Etsy which is great, and has made me realise that corsages are for life, not just for Christmas! I have in the past only tended to make them in the lead up to the festive season, but I’m now beginning to work out that people like to wear them all year round, and maybe I could have paler ones for the the springtime. So that is one thing, another is that we have finally got the tree down from the top of the garden, well John lugged it down, not me! I’m making up some things as presents, and at the same time making up the same bags, but with different linings and designs, what do you think? I have wanted to do this for ages, but never got round to it, I’m really quite pleased with it. Anyway, the holidays have started, and the peace and joy is so overwhelming…………. That sewing needle design is precious – I love it. I hope you have fun decorating your tree! Love the sewing needle design. 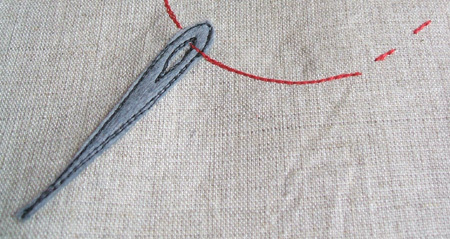 Love the little needle and thread design. I also wanted to let you know that my corsage arrived this morning and I just adore it! Thank you so much. The candy cane and balloon immediately got snaffled by my two small people (cheeky monkeys!). I fear I might have to buy a purple sweater to wear with the corsage to do it justice! Hope you and your family have a great Christmas and a very happy New Year!